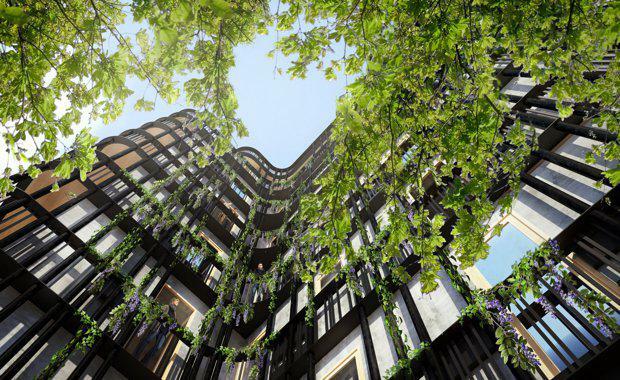 Architect-led development that results in high-quality, sustainable and thoughtful housing have the potential to quietly transform the market. 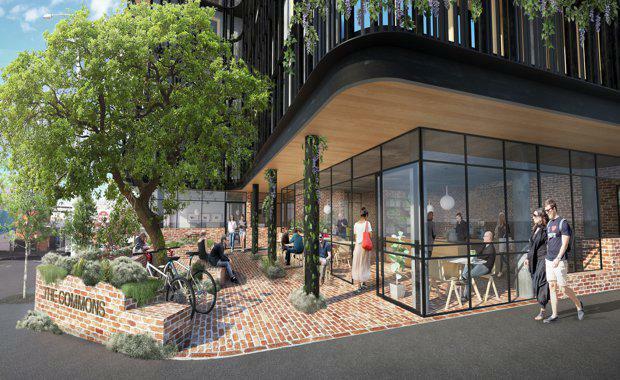 Alternative development models that emphasise design over yield are already taking place in Australia with citizen-led, co-operative development prompting "ethical" developers like Small Giants to undertake projects in this growing market. There's also the not-for-profit Nightingale development -- which achieved incredible success in Melbourne (the waitlist was so significant they had to select buyers by ballot) -- who recently licensed its collaborative model to a private developer for a residential development project in East Brunswick, confirming the model's scaleability. Architects are perfectly placed to instigate creative urban development. Our role [on The Commons] is in collaboration with the developer rather than as a typically engaged consultant." Located on at 126 Bathurst Street, the building comprises 30 apartments, two commercial ground floor spaces, a public garden and a communal roof terrace with a food garden and shared amenity. The Commons Hobart is located within five minutes' walk of UTAS, the city centre, waterfront and medial precinct. "The design stage allowed us to test the idea of a small pocket park on the corner that provides the ground floor café space with outdoor dining; [with] room for a large tree and other planting and gives space back to the city," Strating said. "Another benefit was that the northern corner plan cut-out resulted in two corner apartments on the typical level rather than one – so that was a bonus even though it reduced the possible floor plate. 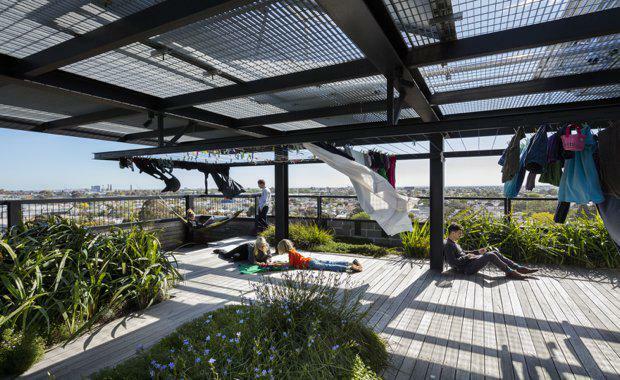 "The building's communal rooftop has a studio space for community events, a laundry and clothes drying area and extensive green roof and food-garden beds. 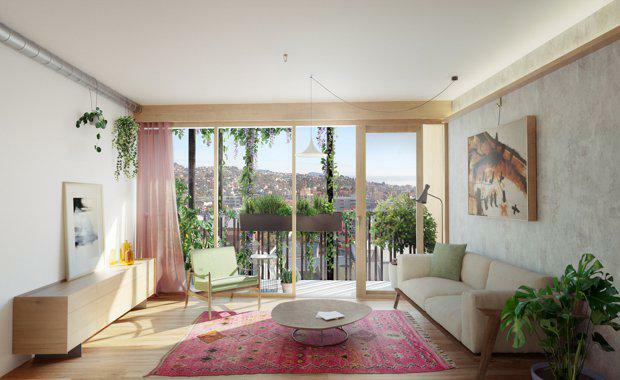 General manager of Small Giants, Clint Hare said that the company identified a growing market for functional, well-designed apartments in Hobart. "We’re hoping to be the catalyst for a movement in Hobart to create better apartments -- ones that not only come with outstanding environmental credentials, but are also a joy to live in," Hare said. Unfortunately Melbourne’s CBD and inner suburbs are littered with low quality, poorly-designed apartments. We don’t want Hobart to end up with the same rubbish." Small Giants co-founder Berry Liberman echoed Hare's comments that community and sustainability were at the core of every decision. “Our intention is to use the built environment to contribute to the world in a meaningful way, and to show how humans can live in harmony with nature and experience profound individual and social flourishing." Liberman said. “The Commons Hobart is a community of people committed to living in a more meaningful way—one where stories are shared over the communal dinner table, and connections are made while watering veggies on the rooftop garden." 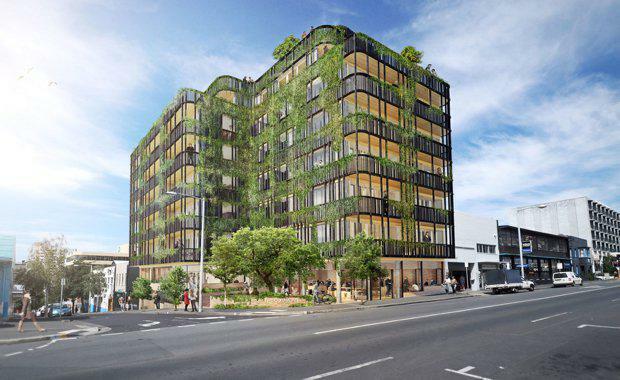 The Commons Hobart will be Australia's first carbon positive multi-residential project, and the emphasis on sustainability is clear -- the apartments will have a nine-star NatHERS rating. The building's materiality uses raw or unfinished materials, brass tapware and Tasmanian oak floorboards eliminating the need for embodied carbon finishes. From the rooftop garden above to the pocket park below, The Commons Hobart is covered in greenery, with flora draping down its façade. And, according to Hare, Hobart Council have been very supportive:"We took a very open and transparent approach with Council. By engaging with them early, demonstrating how we’d created beautiful, award winning and inspiring developments elsewhere and showing them how we wanted to go further with The Commons Hobart, we were received some great feedback." he said. Construction is expected to begin in early 2018. Images courtesy Small Giant Developments.